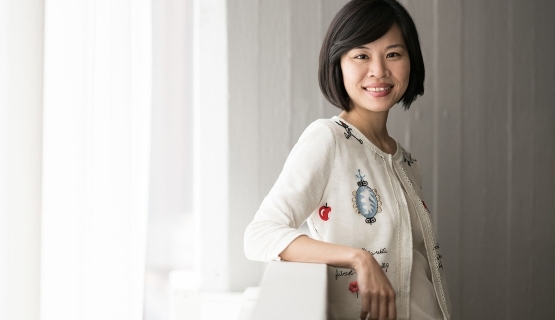 ”I’m not completing the Aalto EMBA program only for the sake of my career but for my personal development on the whole”, says Jo Wu. “I’m Taiwanese and work in Taiwan and Hong Kong. In Taiwan, we run a family business that manufactures industrial blowers. I’ve worked for the company directed by my father, but now work in the financial sector. My father is an engineer, whereas I am a technological and mechanical idiot. I’ve been able to help in the firm’s international expansion and branding despite my lack of technological understanding. These days, I work in the same company as when I graduated: as the director of PC Securities Financial Group. My daily responsibility is to supervise several different divisions of the Group: asset management, the Taiwan insurance division, the marketing department, etc. This means plenty of communication with different divisions, professions, and countries as well. Main takeaway for me has been to realize that a director needs to constantly remember and remind others of the core value of doing this and that." I applied for the EMBA program because I wanted to develop myself as an employee, human being, mother, woman… At one time, I had two jobs, travelled a great deal, and ended up too busy and uncertain about my skills. The studies give me self-assurance and time to think about ways to develop myself. At first, I thought whether I should take time off or start meditating… But then I realized that studying could be a good tool for finding new passions and be filled with positive energy from new people. I want to exchange ideas and thoughts in an international group. I pay for the studies myself. I already know it’s a good investment. I don’t look at completing the EMBA only for the sake of my career but for my personal development on the whole. The EMBA program is a lot of work, but also a flexible way to study. It’s a special time in my life: time to refresh my own thoughts and think about the type of person I am and how I communicate with others. At work, I’m a meeting machine with no time to think about anything else than what’s at hand that day. This refreshes me as a person. So far, the main takeaway for me has been to realize that a director needs to constantly remember and remind others of the core value of doing this and that. Sometimes we are so engrossed in our work that we forget why we are there in the first place, what we aim for, and what is the core value of what we do."